Today’s Blog Action Day, with the theme of Climate Change. Even as this BBC article What happened to global warming? asks whether a period of global warming is giving way to a period of global cooling. The thing is, the question justifies a Climate Correspondent for the news organization, so climate change can’t be ignored. Here at home, the question is more of overcrowding, the plundering of natural resources, the willy-nilly sprawl of human habitations heedless of topography or the interaction between rain, vegetation, and the soils, and so forth. The interaction has been ignored; and so, the result is we have what we have -natural calamities compounded by man-made ones. Two Sundays ago Cecile Alvarez and I had a riotous chat over dzRH radio with Press Secretary Cerge Remonde on his reminiscences about the deluge. He noted that the President’s party had no time for rest after arriving from Turkey and Saudi Arabia. 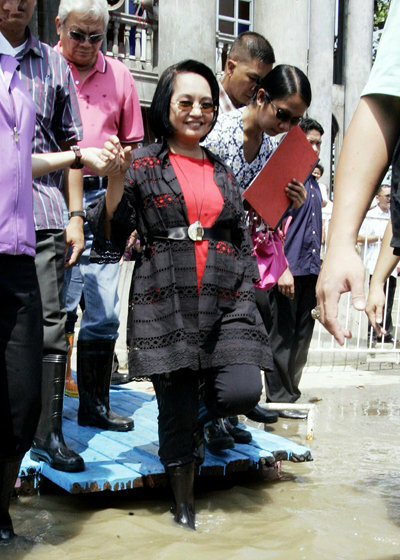 The day before the flood, Arroyo had flown to Iloilo to inaugurate the 15,000th branch of the Botika ng Barangay. That Saturday, she went out of the Palace at mid-morning aboard a six-by-six truck bound for Camp Aguinaldo but couldn’t get beyond Legarda Street. 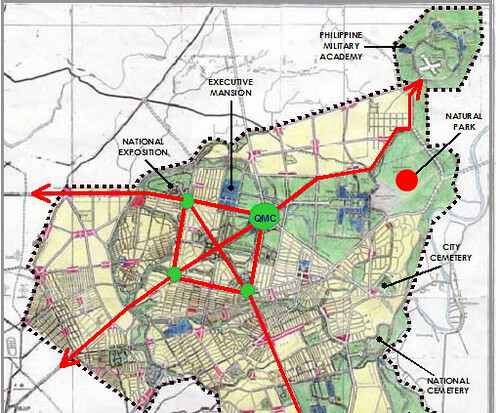 Remonde recalled that Arroyo checked on his location (he had reached Aguinaldo by then). As she later related, she tried to help direct traffic but the water quickly swelled up to her chest and she had to be plucked out on a rubber boat. Her security escorts tried to dissuade her from proceeding, but she argued that if Remonde got to Aguinaldo, there was no reason she couldn’t. Arroyo and a handful of security men were taken to the nearest LRT station and upon reaching Cubao she was fetched by an army truck. Remonde recalled that while presiding at the NDCC conference, Arroyo began calling Metro Manila mayors to locate evacuation sites, and the decision was made to put up advance command posts in badly hit areas. He said that when the presidential party was in Marikina around 11 p.m., no one had eaten. Being a diabetic, he felt faint but a doctor told him not to fall on her as her medicine bag was incomplete. He was finally able to call Rep. Nikki Teodoro, the defense secretary’s wife, and tell her of their hunger. She managed to send some food over to NDCC at 2 p.m. But it’s not as if presidents and the people haven’t been down this road before. 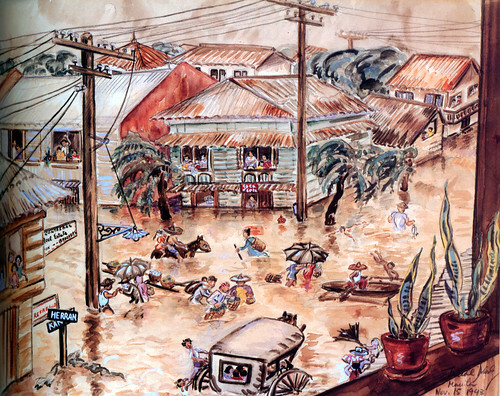 “The Great Flood of November, 1943,” a watercolor by Trudl Zipper. reminds us that humanity cannot bend nature to its will, but rather, nature follows its own inexorable laws. Veteran newsman Ping Galang in After relief come the tough decisions about the future reminds us our localities and many Filipinos have gone through devastating floods and storms before: but now that there are so very many more of us, and so very much of our habitat has been changed by infrastructure, as to compound the effects of natural weather phenomena. My entry for Blog Action Day has been gestating for some time, first as an Ondoy-specific postmortem, and now, including Pepeng’s aftermath. As an urban resident my necessary interests are in harmonizing the advantages or familiarity of urban living with the need to rethink many former assumptions about the vulnerability of urban residents of all classes, to natural phenomena. This brings up the tangled nature of the problem, in which science, politics, institutions (formal and informal), culture, all ended up so intertwined as to make most people feel utterly helpless. Some noteworthy blog entries concerning the Great Floods of 2009 remind us of how natural forces can sweep away human settlements. For Typhoon Ondoy, see Gibbs Cadiz , Billycoy’s Blasted Brain Blogs , House of Squared 3.0 , Soapbox , Real Life Excerpts , Mrs. Supergrift’s harrowing account of Provident Village, Lakwatsero , Juan Country, The Journal of The Jester-in-Exile , tonyocruz, and Guttervomit. Also, journalist Ramil Digal Gulle. The Independent has its story on the heroic death of Muelmar Luz Magallanes. The Inquirer editorials Apocalyptic , People’s mite, and Herculean Task speak of the institutional responses that required private sector back-ups. Photos in Ondoy Tumblr and Boston Globe’s The Big Picture. Videos in Dave Lucas. For Typhoon Pepeng, see “Pangaasi Yo, Apo” in The Marocharim Experiment and Baguio Insider. Photos in Northern Dispatch Weekly, Pinoy Weeky, Monsters and Critics, Boto Mo Ipatrol Mo photos, Jeremias’ Site, and in Sa Likod ng Tabing. There’s a dilemma represented by the Internet allowing people to agonize over the environment while servers consume electricity and require vast airconditioned storage spaces to function. ComputerWorld Philippines summarizes developments that took place in Disaster Management 2.0. See also The Lede Blog, and In Asia. The most notable -and probably, precedent-setting- responses ranged from Rescue InfoHub Central to Ondoy Manila. One particularly noteworthy effort that shows signs of being maintained on a semipermanent basis is Bayanihan Online. However, Sahana FOSS Disaster Management System proved too technical to get off the ground quickly; and hopefully, the really appalling story of how it turned out IBM had given a grant to the NDCC some years back, to set the disaster management system in place, only for IT volunteers to discover during Ondoy, that no actual system was in place, will be fleshed out. By the time Pepeng materialized, online volunteers had received, in a sense, their baptism of fire. Bury Me in This Dress knew what to do; Ralph Guzman knew what to do: provide directories for people to refer to. RescueHub North Luzon: SOS Calls was another direct descendant of pioneering efforts, just days earlier. 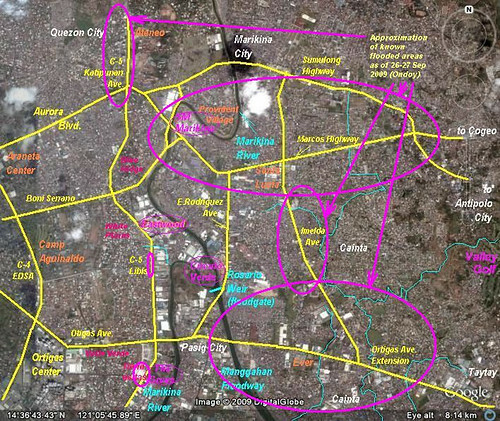 View GMANews.TV Storm Watch: Pepeng in a larger map, for a direct descendant of the Ondoy Manila volunteer effort. See also ABS-CBN Northern Luzon Floods, October 2009. While media was able to quickly sense the information-providing opportunities provided by volunteer-managed and created disaster maps, I began to wonder if branding these efforts wouldn’t lead to a wasteful mutiplicity of maps. This concern was eventually addressed by volunteers creating a Disaster Coordination Tool, which would include data created in media outfit map projects. The way this tool works is as follows. You need a Gmail account to log in and use the tool. Type in the area, and then select option/s for the report: Insufficient Basic Commodities; report someone who needs Rescue/Stranded; report Missing Individuals; identify areas that lack Electricity, Water or which have no Cell Signal. And the general time frame for these reports. Another menu option allows you to visualize the vicinity of a disaster. You’ll see if you try it out, the tool now has a global application. I think it’s fair to say that the Philippine experience gave birth to a volunteer effort of potential benefit to the entire world. 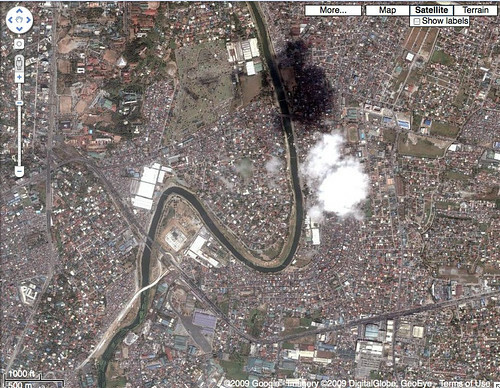 Continuing online efforts include the Citizen-based interactive flood map (the actual Google Map is here), and OSM-PH Post-Disaster Response Reporting. 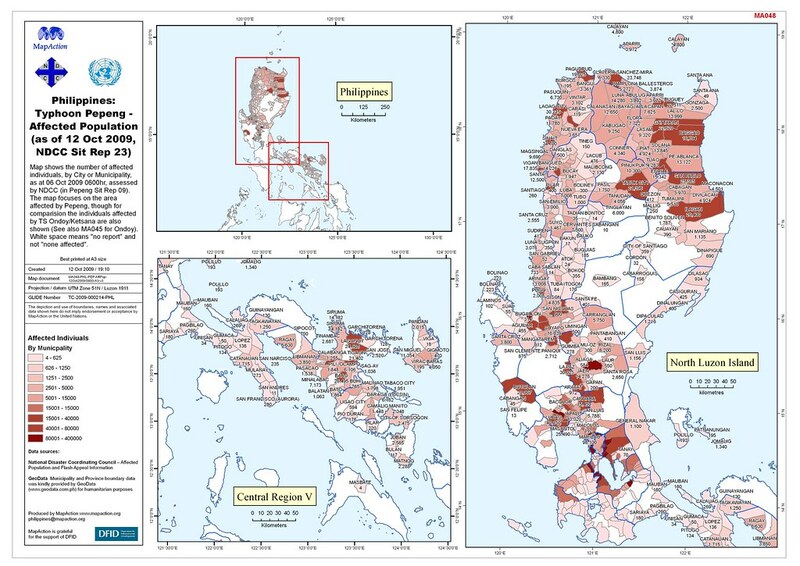 The map above shows populations affected by Ondoy alone. The map above, on the other hand, shows standing water depths days after the flooding took place. The map above represents one of the first updates on Pepeng’s effect on infrastructure, including dams. The more recent map above, continues to focus on flooding and dam water levels, as the effect of massive prestige projects like dams (for flood control, irrigation, and the generation of electricity) becomes a hotly debated issue. 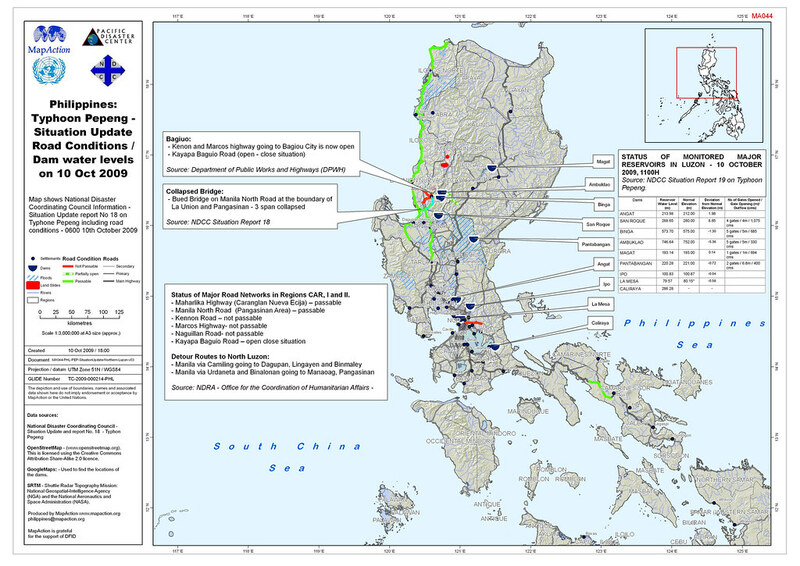 The map above gives an idea, based on official reports, of populations that have been displaced and have sought shelter in evacuation centers. 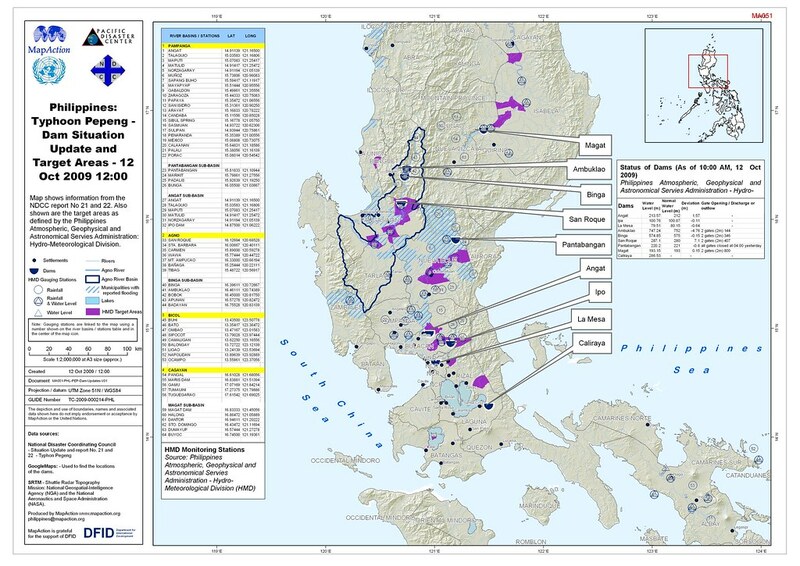 However it’s this map, above, that demonstrates the scale of the Pepeng calamity: and the competing interests, between lowlanders and highlanders, centers that seek irrigation under controlled circumstances, and everyone wanting more and more electricity, and urban congestion leading to settlements and construction along flood plains in Northern Luzon. 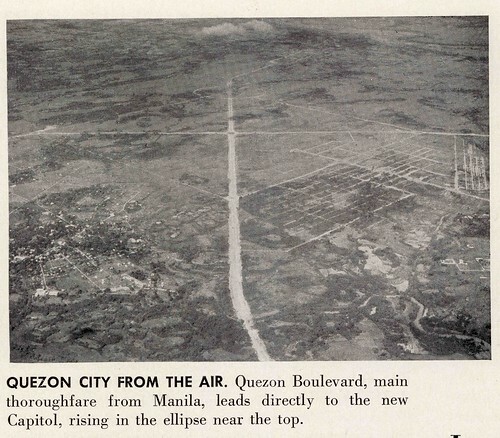 The illustration above, circa 1940, points to the twin issues of planning and urban congestion -with the sub-issue of actual infrastructure- that were starkly brought to the public’s attention beginning with the devastation wrought by Ondoy. If terribly typhoons and massive floods are periodic phenomena, and if experts knew of these phenomena, why then, did so many people still suffer? The need for a new national capital, besides political imperatives (creating a modern metropolis for nations emerging from era of colonialism, something seen in Canberra and Brasilia, etc.) also had other imperatives to push the plans forward too: Manila had already outgrown the 1905 Burnham Plan by the late 1930s, for example. 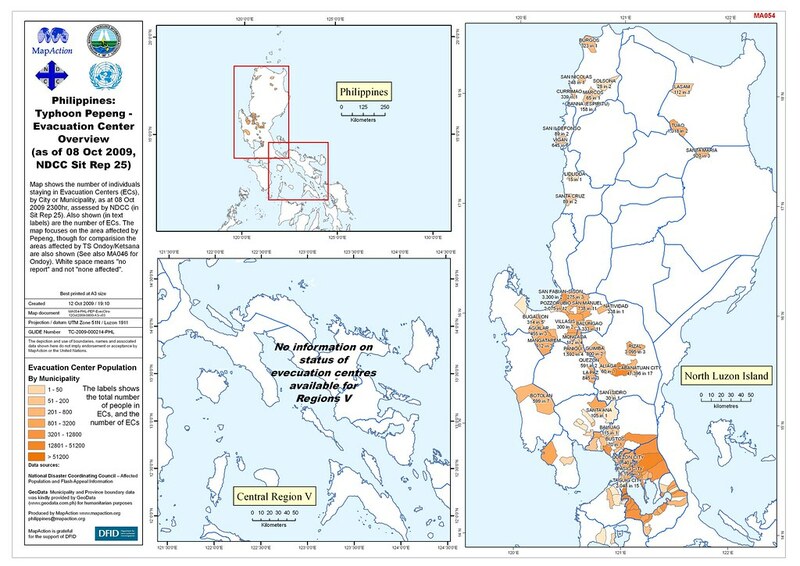 The map above comes from George Bankoff’s 2003 article Vulnerability and Flooding in Metro Manila, and shows the naturally flood-prone portions of the Metro Manila area. The map above comes from Flooding in Metro: who is to blame? by Newsbreak which shows that the actual flooding that took place shouldn’t have surprised anyone. What did surprise people is that veen in normally flood-prone areas, the depth of the floods, and the speed at which water rose, was unprecedented. The denudation of watershed was obviously a culprit, as is the destruction of so much green space within the metropolis. 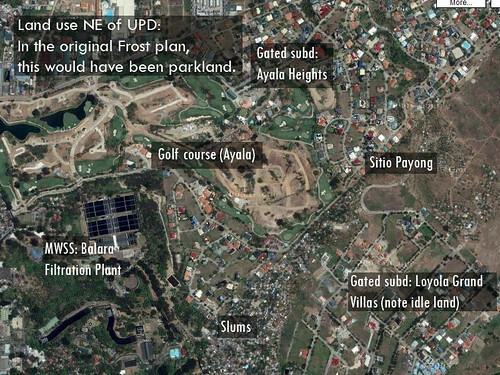 An article originally conceived online, Who do we blame for untrammeled hyperurbanization in Metro Manila? by Kenneth Cardenas, points out that in the late 1930s the need for watershed areas had been recognized and actually planned for. Here he illustrates the difference between the areas planned as green spaces (parks and watershed forest preserve) in the 1939 Quezon City plan, and how it turned out at present (basically: no green spaces were preserved). 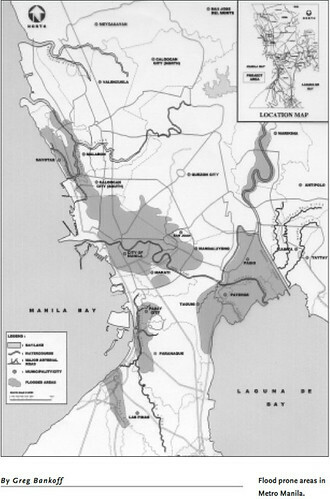 The parks within the urbanized areas of Quezon City were supposed to compensate for the smaller lots that would make the city affordable for government employees and blue collar workers; while a large belt of forested watershed land (on the right side of the map) was precisely allocated because these areas were identified as flood-prone areas to begin with. Again, contrast the planned development with how development has actually taken place, the patches of green being insignificant compared to what was deemed necessary for healthful city living. Another illustration provided by Cardenas shows what should have been parkland given over to all sorts of other uses. The illustration above comes from a graphic provided by environmental planner Armando N. Alli, focusing on the parts of Marikina and Quezon City that in olden times would have been filled with creeks and with a historical tendency to flood. Today it’s a big urban sprawl of shanties, gated communities, factories, roads. Alli marked out areas in magenta as the places that flooded badly. In some cases they coincide with relatively new public works, like the stretch of C-5 along Ateneo or in Libis, or part of Imelda Avenue. Such places may have sliced through natural drainage or older man-made drains, basically serving as dikes that trapped rainfall, which the concrete-covered communities couldn’t absorb, but which couldn’t drain into the Marikina River. And yet, the illustration above, from 1940, shows that prewar infrastructure seemed more in harmony with the natural terrain; Alli told me that present-day roads do not provide for efficient drainage into natural channels because this is expensive. Flooding happened in Metro Manila because of high rainfall and the inability of drainage system to cope with the volume of water, why? – In spite of flood control plan made in 70s the proposed system was only partially completed – Manggahan floodway is only one of two major outlets for storm water (the planned Paranaque spillway never got constructed). -Manggahan and the rest of the other drainage infrastructure including rivers, streams, esteros and canals are all blocked up with either accumulated garbage or informal settlers. management in aquifiers underneath the whole region (that is compromised too by all the urban sprawl pumping all this water out-and negatively impacting on surface run-off patterns). – the above dysfunctional governance coupled with extensive urbanization, which reduces the ability for the whole region to absorb storm water, leads to a situation of total chaos-as no resposibility or accountability rests on anyone (unlike all other major metropolises in Asia which are governed by metroauthorities). -private developers comprehensively ‘masterplan’ only within limited boundaries of their client’s lands. The main objective of the drainage plans of these developments is to just throw out any storm water to the nearest main road system or waterway. Since these developments often cross political LGU boundaries they fall in grey areas of territorial accountability and responsibility. management. The remaining open land either in the lowlands or up to the hills of Antipolo and Montalban are being ravaged indescriminately for more urban sprawl ensuring a future of increased stormwater surges that will far outpace any mitigation fratured LGUs can throw at the problem. There remains the need for coordination, as pointed out by The Blips Network. See Uncoordinated disaster: The first 48 hours of Ondoy in the blog Random Salt. 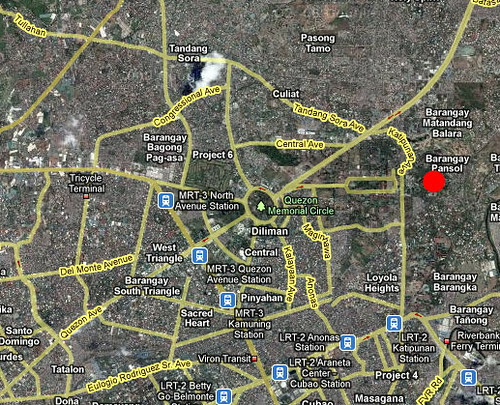 There’s this map: View NDCC asset deployment (First 48 hours of Ondoy) in a larger map. Also, Express Yourself. A review of the Official History of the NDCC suggests that as its membership has expanded, its authority has dwindled and the capacity to plan ahead and not just respond, has diminished over decades. 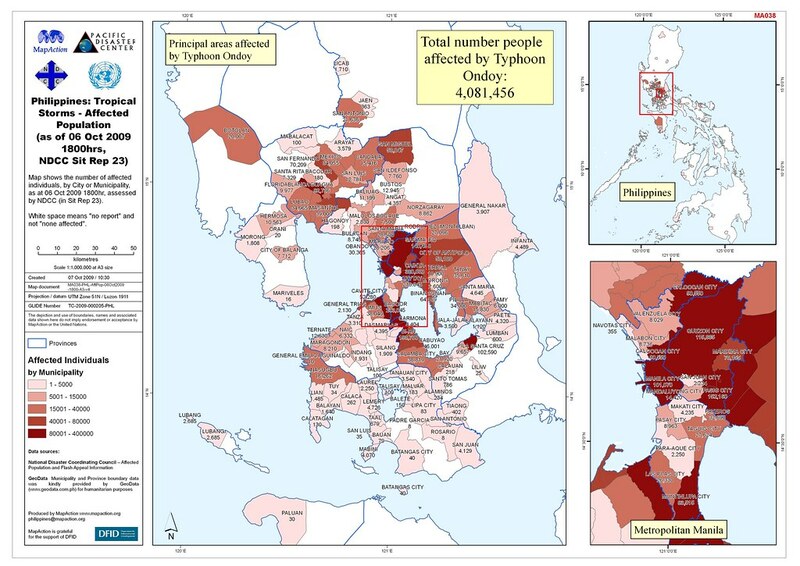 A look at The Philippine Disaster Management Story: Issues and Challenges, prepared in 2001 in Thailand, gives an overview of this situation. The Manila Times proposed Appoint a disaster Czar which is what the House proposed three days later. Here is one of the more recent drafts of the proposed law. The law, by all accounts, is a necessary one; but there remains the need for a postmortem. 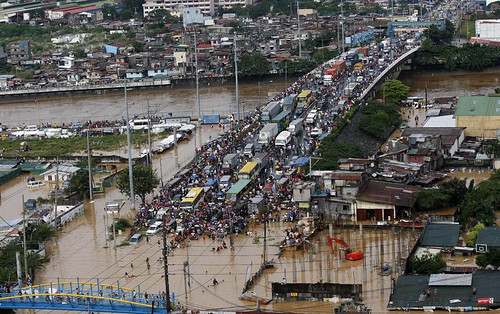 For infrastructure, zoning, and development, Paulo Alcazaren proposes Lessons from the deluge. He’s long advocated the creation of a NCR-wide authority that subsumes existing local governments into a metropolitan government; his notes on the Malaysian and Singaporean insistence on integrating parkland into flood control makes for interesting reading. As a practising Environmental Planner and former Commissioner for Planning of the Metropolitan Manila Commission (1979-1989), I would like to suggest the following actions in the wake of the disaster brought about by typhoon Ondoy. 1. 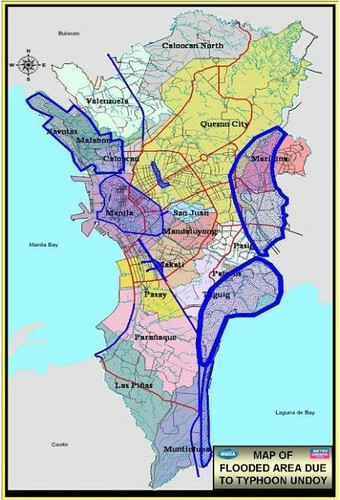 Immediate preparation of a Sub-Regional Structure Plan (covering the areas of Markina, Pasig, Pateros, Taguig, and portions of Cainta and Taytay) to guide future Government policy towards urban development in the area. This Structure Plan should indicate the desirable pattern of urban growth and preferred dominant land uses for at least the next decade. 2. Strengthen the coordination mechanism between MMDA, HLURB, LLDA, and local authorities concerned in the enforcement of urban development controls. 3. For the local authorities to initiate public-private participation in the formulation of local area plans for communities situated within flood-prone areas. 4. For the national government to immediately issue a directive disallowing any expansion of settlements and roads in flood-prone areas. 5. For the local authorities, in cooperation with HUDCC and its attached agencies, to immediate formulate shelter plans, particularly for low-income households. These plans should include on-site upgrading of depressed communities, sites-and-services projects for self-help housing, and estimation of land requirements for future low-cost shelter projects. 6. For HUDCC to immediately issue a directive enforcing the 20% balanced housing requirement within urban areas. 7. For the local authorities and HLURB to immediately review current Comprehensive Land Use Plans (CLUPs) and Zoning Ordinances, and revise these accordingly to mitigate the adverse effects of future floods. 8. For local authorities to carefully review all new subdivision applications in terms of drainage and flood control implications, and to confer with DPWH and LLDA if necessary. 9. For local authorities to increase fines for violations of zoning ordinances and building regulations. 10. For HLURB to immediately review and amend current subdivisiond design standards, particularly the 30% open space requirement, since proposed subdivisions in flood-prone areas and/or adjacent to waterways may require more open space for flood mitigation purposes. 11. For the national government to study the possible revival of the Regional Cities Development Program which was aimed as developing counter-magnets to Metro Manila. This study should explore the feasibility of prioritizing current and new investment incentives provided by BOI, DTI, PEZA, PRA, etc., as well as the house loan programs of Pag-Ibig, to these cities. This list is by no means exhaustive, but rather what immediately comes to my mind. Also the agencies I have mentioned may not be complete or appropriate as I have been out of the country for an extended period of time and not fully up to date on current institutional and administrative arrangements. I hope this is helpful. On an additional, architectural note, this Filipino entry to a Guggenheim Foundation Shelter Design Contest, points to the growing desire to make even emergency dwellings ecologically-friendly. For the costs, in micro and macro terms, see How much did Ondoy cost? For starters, try P23 billion. It’s crucial to note this article only illustrates the all-too-low estimates for Ondoy; officialdom is only beginning to grapple with the costs of Pepeng. The private sector, too, is grappling with the problem of the long-term costs of the twin disasters beginning to sink in: see How to Compensate for Donor Fatigue (in Pepeng relief). 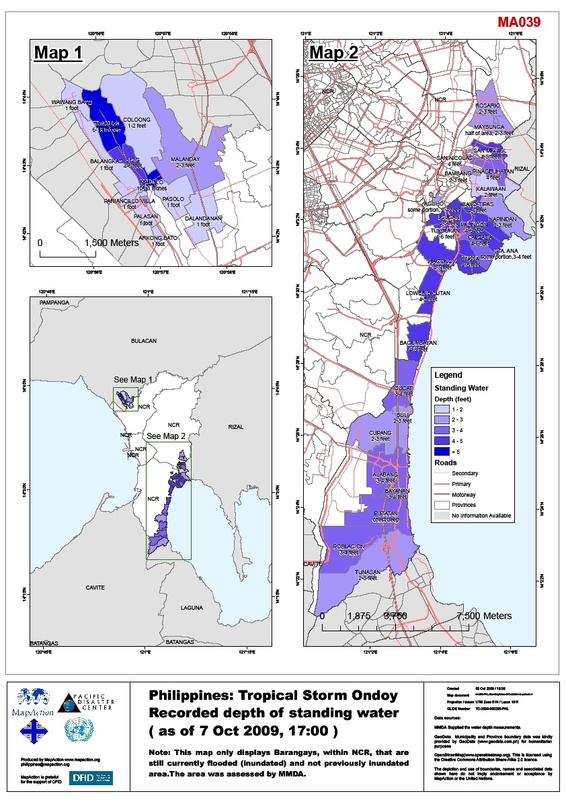 Aside from the online mapping initiatives linked to above, the need for accurate and timely scientific data is covered in Free our data: rainfall and water level monitoring. This extremely educational entry points out the need for a better flood monitoring and forecasting system. For media, John Nery in his column takes a look at Processing disaster news. What remains to be done, is to connect these emergencies with past ones. The mudflows in Iloilo last year, the flooding in ARMM earlier, too, and past calamities in overlogged areas, all are part of a reality that is getting increasingly catastrophic because the frequency of calamities is increasing. Manolo, if you don’t mind me saying. This blog has officially become an institution. There was a an episode of The Correpondents” that show the towns that shouldn’t become an area for subdivisions, buildings and other big infrastuctures. That might be one of the reasons why blockage of the drainages occur. That’s very kind of you, Brian, thank you. Many thanks for an integrative blog. Where most blogs often only speak of current affairs, yours frames the historical, socio-economic and related underpinnings of most issues. It seems we are forever caught in a vicious circle of policy mistakes, lack of foresight and political will. When will we learn that those who do not remember the past are condemned to repeat it? Incredible! This is almost a doctoral dissertation.Well done Dr.Mlq3. Is there any plan to open the Napindan flood gates or install temporary pumps to lower the water level of Laguna de Bay? Germany sent portable pumps to New Orleans to reduce the water level. Now, i know what to put in my blog. Thank you. This blog is very engaging. So much to learn from the flood. One singular thread that has come out of this natural calamity and the reactions across the spectrum of the political economy. The need for an all encompassing institution that will arbitrate the needs of Pinoys relative to their environment. That institution is an effective and proactive state. Land use and zoning cannot be left entirely to the private sector with the state following behind. Private sectors interests are short term. However the state has to look at the long term picture of human and environmental sustainability. The economic model of simply monetizing land and its resources without regard to the sustainability of humans and the environment we require to survive requires a rewiring of our mindsets. Over 70% of the national budget is under executive control. Today personal services, debt servicing, maintenance leave little room for the creation of public goods necessary to simply start to correct the ecological disaster we have created. Wishing for a first world standard for urban infrastructure would require the material base necessary from a first world economy. Nothing much will change unless drastic measures are undertaken but no one seems to quite grasp the problem of moving away from the extraction of money simply from resources. There is really no need of Disaster Czar. We are just replacing one bureaucratic impotent (NDCC chairman) with another bureacratic impotent (Disaster Czar). Both House and Senate need to reexamine their positions why the gridlock in resources during disaster. Disaster is an extra-ordinary event and normal channels are expected to bog down or simply will no longer exist. In all disasters throughout the world when all else failed, there is only one channel that can be seen right away and always the 1st responder – the military. The military day-in and day-out is tasked to execute and obey. Lawmakers should only pass a bill that will create a preset of orders that the military can execute in time of disaster. It is due time that we use the military for its best performance, serving the national interest – its population. Great piece of work, Manolo! As Manolo points out, “itâ€™s not as if presidents and the people havenâ€™t been down this road before”. While the memory of this disaster is fresh, there’s a lot of introspection going on. But, after a few months, when this is all but forgotten, I agree with J_AG that “no one seems to quite grasp the problem of moving away from the extraction of money simply from resources”. As we have done in the past, we will soon be back down the road of wicked and reckless exploitation of our environment and resources. I saw that picture of GMA alighting from that wooden raft in the PhilStar, and I think she’s a bit insensitive in her sense of fashion. While those victims lost their clothes and now, could hardly change to fresh ones, she’s there wearing nice-looking clothes as if going to a baranggay party. Agree with all the congratulatory remarks made above. This blog entry highlights the need for greater planning and coordination in anticipation of the greater risks posed by climate change. The El Nino/La Nina weather pattern means that the country is at risk from the effects of drought and flooding in cyclical fashion. In the wake of the ferocious bushfires that have affected California and Australia, authorities have begun revisiting building and development codes, improve emergency procedures, restrict further urban development in at risk regions. We would do well to do the same. But the added burden for the developing world has to do with informal settlements. The government will be coping with internal migration if fiercer storms are going to be a regular pattern. Squatters will continue to be a problem because development will continue to favor NCR and large cities. Livelihood opportunities is the powerful magnet that attracts informal settlements, particularly to the NCR. Of course, fiercer storms in Southern, Central and Northern Luzon may also compound the problem. But Mindanao doesn’t suffer from typhoons, yet people are also migrating. War and lawlessness may contribute to this, but it’s ultimately the lack of development and livelihood opportunities that causes people to flock to the large urban areas. We should just kill people than reform our politics and infrastructure. It worked in Europe during World War II and The Great Plague. Hey GMA, if you’re reading this blog, the Swine Flu is a good excuse to execute this. We can hire a few mercenary microbiologists who can taint adjuvants to kill or sterilize half the population. As you have control of the legislature, enabling laws to mandatory swine flu shots can be passed. It could be her biggest legacy. We can call this the Project for a New Philippine Century. Okay guys, please fall in line. You, SoP, first, then GMA second..hehehehe. Me, I’m going back to my seashore in my hometown, the cleanest seashore in the world facing the Pacific Ocean, somewhere in the province of Albay, the Bicol Region. Mrs. Supergriftâ€™s harrowing account of Provident Village has an important message. Right-to-bear-arms and owning a gun is a way for families to be able to protect their households against looters. Bert, tell your fellow Bicolanos to stop over-breeding and over-populating Manila..hehehehe. Me, I’m going back to my landlocked hometown, the most fertile and flattest topography above sea level in South East Asia, somewhere in the province of Pampanga, Central Luzon Region. I’m sure Filipinos have a right to license arms. The problem is escalation. May bagyo na naman, and if LUPIT heads just a little bit more to the south, direct hit Metro-Manila on Wednesday/ Thursday. Over 120Km/hour wind and heavy rains. With a population rate of 2%, anything that is cleared now will be populated in the future. Of course, a large percentage of the 100 Million Filipinos would like a house with a river view too. But I guess it’s good to have a large population, we can build a human chain of sand baggers. And let us not worry so much. The Catholic Bishops Conference of the Philippines has no doubt formulated a more powerful oration. The Interagency Committee on Informal Settlers estimates it would cost Php13B a year for ten years to resettle over .5M families from Metro Manila. About 20% of them live in at risk areas which is about Php2.6B a year for environmental migrants. This is a doable thing if we factor in the cost environmental protection as a chunk in the disaster contingency funds. great post mortem. i hope somebody with influence, power and resource reads it and acts on it real fast. nash, agree. and you will be surprised the future is just a year away. because anything that is cleared now will be populated by the same people who were removed, as always happened. And the 3 billion every year for relocation becomes another major scam. Manilans are so desperate to remove the blight in their town they’d grab tight to even the most sketchy solution. All they’ll get is more trouble for the same result. I beg your pardon, it’s organised by region, so it is easy to look up the relevant organisations. Thank you for posting!